I am here to provide our patients and their families with a comfortable environment by helping Dr. Mau implement treatment. In addition to being an RDA, I help our patients by answering treatment or financial questions and scheduling their appointments. It is so rewarding to watch everyone grow up over the course of orthodontic treatment, and it’s amazing to see the change in confidence when they end up with a beautiful smile! I like working here because we have a close-knit, personal relationship with our patients and their families, as well as with each other. I can genuinely say that I enjoy coming to work! I have lived in Lodi my whole life and really enjoy being a long-time member of this community. My husband and I have a daughter, a son, and a dog named Milo. I like to watch my kids play sports, watch football (go 49ers! ), read, watch movies with my family, cook, and bake. It’s hard to believe, but I’ve been in the dental field since 1977! I spent the first 15 of those years as a chairside RDA, and the rest in front office and management. I’ve taken many continuing education courses over the years, from classes in dental techniques to computer scheduling and insurance. I’m happy to use my experience and education to help our patients have a seamless orthodontic experience. I love interacting with patients while they undergo treatment, especially when they see their new smiles! I’ve been married to Steve since 1982! 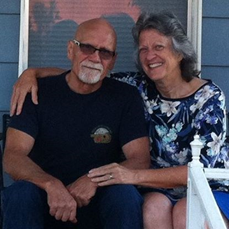 We lived in Calaveras County for 22 years and have been in Lodi since 2012. Our son Syon is married to Heather and is a personal trainer in Santa Cruz. Our daughter Kaylee is married to Billy and is a doula and the busy mother of our granddaughter, Abbygail. We have two Chihuahuas, Pachis and Buddy.